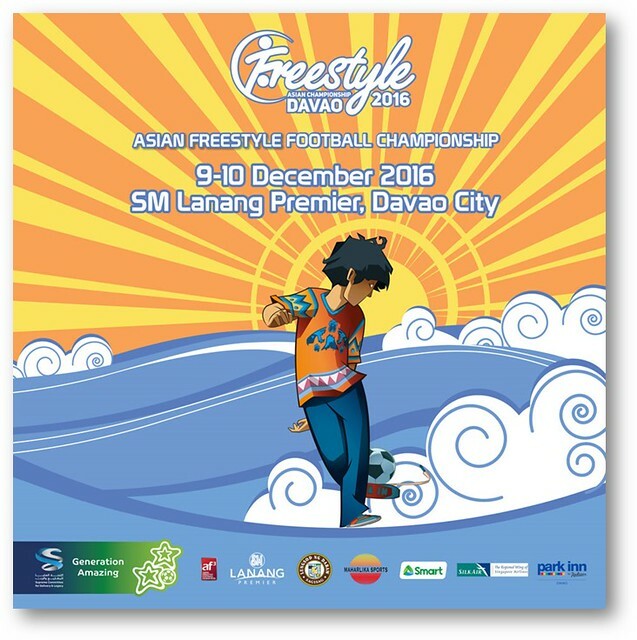 Top freestyle footballers from all over Asia will be coming to Davao City on December 9 to 10, 2016 to compete in an international competition at The Fountain Court grounds of SM Lanang Premier. Thirty-five (35) ranking athletes from 12 countries will vie for the title of Asian Freestyle Football Championship 2016, an event governed by the World Freestyle Football Federation, the Asian Freestyle Football Federation (af3) and delivered in partnership with their representative body in the Philippines, Maharlika Sports. They represent Brunei Darussalam, China, Hong Kong, India, Indonesia, Japan, Malaysia, Philippines, Singapore, Thailand, Vietnam and even the South American nation of Brazil. The said event in Davao City will be the 4th edition of the event that has been hosted in previous years in Hanoi, Vietnam, Kuala Lumpur, Malaysia and Jakarta, Indonesia. Mallgoers are invited to watch the Asian Freestyle Football Championship and enjoy ultimate football entertainment at the metro’s premier shopping and lifestyle destination. The launch and qualifying competition will be held on Friday, December 9, 3pm to 8pm, and the finals will be on Saturday, December 10, from 5pm to 8pm at The Fountain Court grounds. Admission is free. World Freestyle Football Federation President Daniel Woods and Commissioner Ramon Fernandez of Philippine Sports Commission are expected to grace the said event. This highly anticipated sports event is supported by a range of local and International partners – Generation Amazing (the flagship CSR programme of the 2022 FIFA World Cup QatarTM, which uses the power of football to deliver key values around inclusion, health and the environment to young people), SM Lanang Premier, Smart Communications, Park Inn Davao, Silk Air and the City of Davao. The World Freestyle Football Federation defines freestyle football as the “art and sport of juggling a football using all parts of the body to entertain audiences and outperform opponents in competitions” and “a fusion of tricks with a ball, dance and music.” One of the rapidly growing sports worldwide, freestyle football has attracted more than 40 million viewers watching videos every month and numerous events on the sport taking place across 5 continents. Catch this thrilling football event happening at SM Lanang Premier. For event updates, check out SM Lanang Premier’s official account on Facebook, Twitter and Instagram.